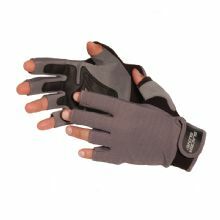 These unique gloves are made from comfortable knit cotton Lycra with stylish, synthetic leather palms to protect anglers' hands when handling and fighting big fish. The index finger and thumb are re-enforced with synthetic leather to protect the wearer when they come into contact with fishing lines and reels. The fingerless design enables the wearer to have full dexterity which is essential for fly fishermen and big game anglers. Comes with a glove for each hand.